Charles Wells is the holding company of leading brewer Wells & Young’s and the Charles Wells Pub Company based in Bedford, UK. Originally founded in 1876 and still one of just 32 independent family brewers in the UK, the company now manages a portfolio of ales and lagers including Wells Bombardier Bitter, Young’s Bitter, Courage Best and Directors, Wells Eagle IPA, Red Stripe Jamaica Lager Beer and Kirin Ichiban, the renowned Japanese lager. It is also the sole UK distributor of Corona Extra, the world’s fourth-largest beer brand. Charles Wells’ annual report is produced by Evolving Media Ltd, an integrated agency also based in Bedford. 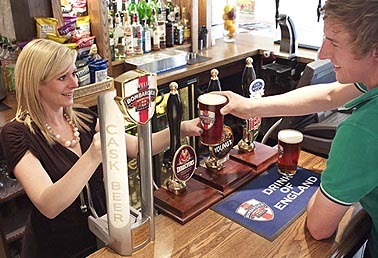 For the 2009 edition, we were approached by Evolving and asked to source 25 men and women to be photographed in the company’s pubs. The resulting imagery would be used to bring colour and interest to the report. A total of around 500 photos were taken in all, which were then whittled down to around 40 images for use in the annual report. “Everyone was pleased with the results,” says Martin. “We got a nice cross-section of styles that illustrated everything we needed, and we didn’t have to do any extra photography.